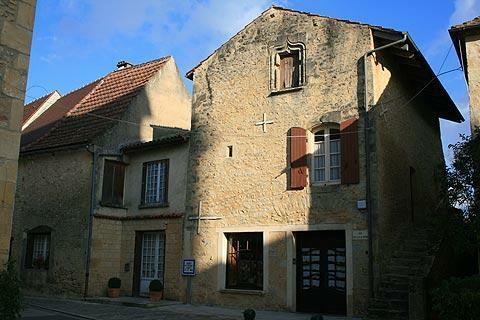 The little village of Tremolat is on the Dordogne river, on a large sweeping bend of the river to the east of Bergerac. It is visited both for the pretty village and for the lovely views from the nearby belvedere. France This Way comment: the pretty village and the proximity of the viewpoint at the Cingle de Tremolat together make Tremolat a firm favourite with visitors to the Dordogne. Note: If you are looking for Trémolat Tourist Office it is a short distance outside the centre of the village, just a few hundred metres to the east, not very well signposted from the centre but easy to find once you know it exists! 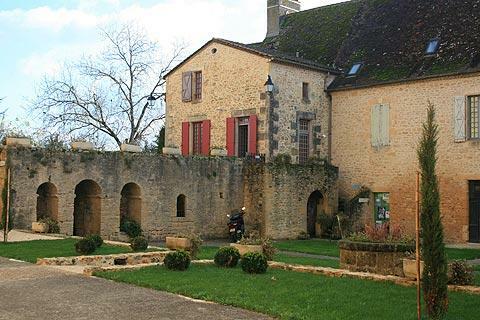 1) The large Church of Saint Nicolas is in the centre of the village and dates from the 12th century. At that time it had various associated monastic buildings, of which traces can still be seen in the area immediately to the right of the church. This area once held the cloisters (they disappeared during the Hundred Years War) and you can still see three stone arches that were once part of the 'salle capitulaire'. Although not much remains these provide a tantalising glimpse of what must have once been an important religious centre. 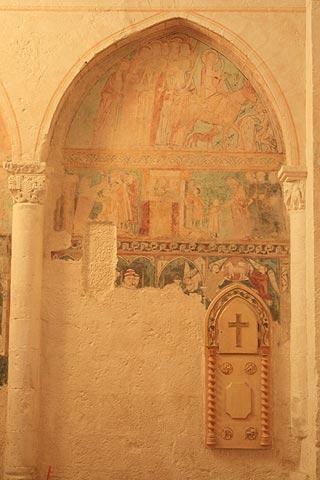 Inside the church the principal attraction is the 14th century frescoes, one of which depicts the Last Supper. 2) Just on the edge of Trémolat there is a second church, within the grounds of the cemetery. This church, also 12th century, is a fascinating contrast to the Church of Saint Nicolas. It is very small, and has a lovely roman style facade with ornate stonework around the doorway. The rear part of the church was rebuilt in the 15th century. You can also see a traditional bread oven in the village and there are several restaurants around the village centre. 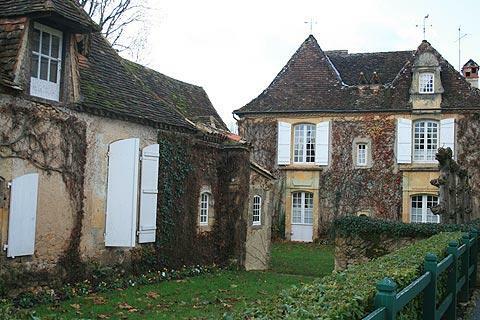 In the centre of Tremolat you can stay at the Le Vieux Logis hotel, one of the nicest hotels in the Dordogne and with an exceptional restaurant - or just visit for a meal on their beautiful terrace, although a reservation will almost certainly be needed. Not the cheapest hotel, but well worth the extra expense! Just outside the village there are viewpoints where you can admire the scenery - above all the views from the Belvedere de Tremolat are magnificent. 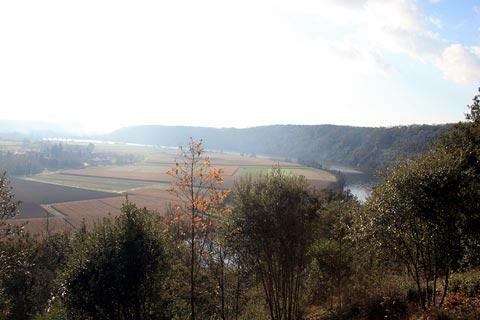 The view stretches about 180 degrees across an enormous bend in the Dordogne River, with hills to the outside of the bend and flat, agricultural land inside the loop. To reach the Cingle de Trémolat follow the signposted route about two kilometres west of the main village. The picture below, like all pictures of the view from the Cingle de Tremolat, fails to do justice to the view, because a camera can't capture the scale. Note: the view can become rather obstructed by the trees. If you walk a short distance along the paths to the left or right of the main viewpoint you can usually find a more clear view! 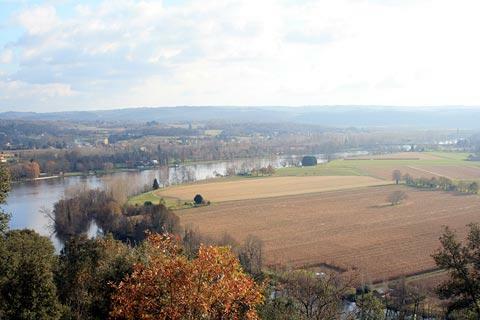 In the other direction from Tremolat is the Cingle de Limeuil, another raised belvedere area above the a large meander in the Dordogne river (in my opinion the views are a bit less impressive here, but still recommended). There is also a 'plan d'eau' (a place where you can take a dip in the water to cool down) at Tremolat. Note for cyclists: there are many cycle routes in the region, but the one that follows along the river and includes the Cingle de Tremolat and the Cingle de Limeuil is one of my favourites, and on quiet roads for most of the year. Bit hilly though! 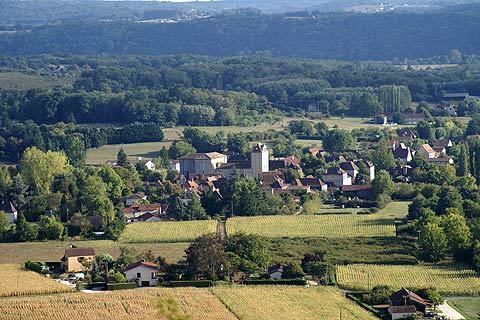 There are numerous attractive villages nearby including Limeuil, one of the 'most beautiful villages of France', and many scenic highlights such as those along the Vézère valley to the east of Tremolat. 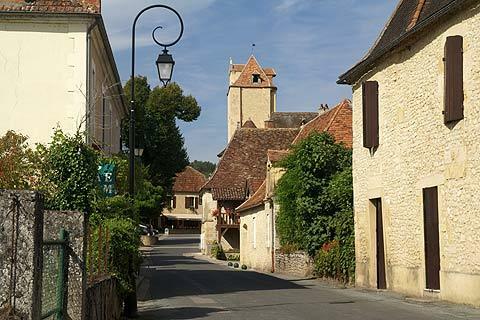 For somewhere slightly less visited than these better known sites we suggest you take a trip south of the river to visit the quiet villages such as Cadouin and Molieres.